Monday Morning Mentor is Back! Here at the FLC, we have often written about the perils of cluttered PowerPoint presentations, and over-bulleted slides with lists and lists often seen in presentations or eLearning materials. Yet, numbered lists and bulleted lists can be powerful tools when used in thoughtful ways. 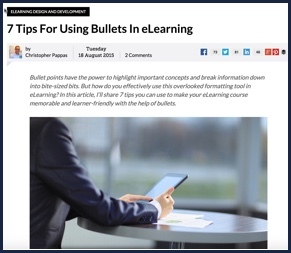 Christopher Pappas provides a nice list of 7 Tips for Using Bullets in eLearning. See what you think! 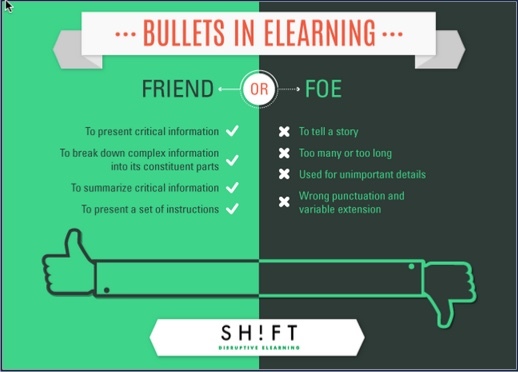 And if you are interested in this topic, SH!FT’s Karla Gutierrez posted “Bullets in eLearning:Friend or Foe? which is also worth the read.